750 million Chinese are expected to travel this upcoming National Day Golden Week (1 Oct – 7 More importantly, with Q2 2016 data tracking showing a 16% y-o-y increase in outbound traveling from China, those jetting overseas from the 750 million mentioned above are expected to surpass the record of 4 million Chinese who travelled abroad during last year’s National Day Golden Week. It’s certainly no wonder that more and more Chinese are choosing to head overseas to beat the domestic crowds during Golden Week. Golden Week – what’s all the fuss about? Golden Week has been a money-spinner across the globe in recent years. And with China ranking first in the world in terms of overseas spending – Chinese tourists’ overseas spending saw a 25% y-o-y increase to hit $292 billion in 20157 – the prospect of another bumper Golden Week sales season looks very strong indeed. Indeed, as one of two annual weeklong public holidays in China, the National Day Golden Week offers a huge opportunity for many to capitalise – especially seeing the fast-growing flow of overseas spending from China’s big spenders. That said, where will Chinese tourists be heading to this October Golden Week? Over 4 million Chinese outbound travellers: where are they going? From Harry Potter to the British Monarchy, and from the Buckingham Palace to the luxury shopping haven that is Bicester Village21, the UK holds much fascination and great appeal to Chinese tourists. Now with the post-Brexit impact that has seen the RMB strengthening by close to 10% against the British Pound, Chinese tourists are already flocking towards the UK.22 In fact, Chinese demand for UK properties have surged post-Brexit as well, so you can bet that the UK will be on the list for Chinese this Golden Week. Competition for Chinese wallets ratchets up: who benefits? As Golden Week becomes a global phenomenon, more and more businesses are wising up to its potential as a highly lucrative sales season. And with China’s new government policies attempting to cool down its real estate market, following a property boom during the past 18 months, Chinese buyers are now finding it harder than ever to purchase property in major cities across China.26 Nevertheless, despite policy tightening, Chinese property demand remains strong. Case in point: Hangzhou. Chinese buyers in Hangzhou rushed to book 5,105 property purchases a few days ago on 18 September27, which happened to be the day before purchase restrictions clamp down on property sales to non-city residents were enforced. Hence, as domestic conditions get tighter and prices rise, overseas real estate is looking more and more attractive than ever for Chinese buyers. And seeing as policy clampdowns in China are coinciding with the Golden Week period, this makes Golden Week a fantastic opportunity to tap into the demand from China’s growing base of internationally-minded property investors. So, what we can expect is that Fly ‘n Buy Chinese will be out in force and with their eyes open for great property deals in the holiday hotspots listed above, as well as in the top 10 countries on Juwai.com – five which happen to also be in the above list of preferred tourist destinations for Chinese. Update your property listings: Detail makes all the difference with Chinese buyers, so make sure your property descriptions are updated with important features, including local transport connections, professional-standard photos, and an extensive range of contact options. Match your market: Chinese buyers place heavy emphasis on local education options, transport links, surrounding Chinese communities, local attractions, medical facilities, and long-term investment prospects. 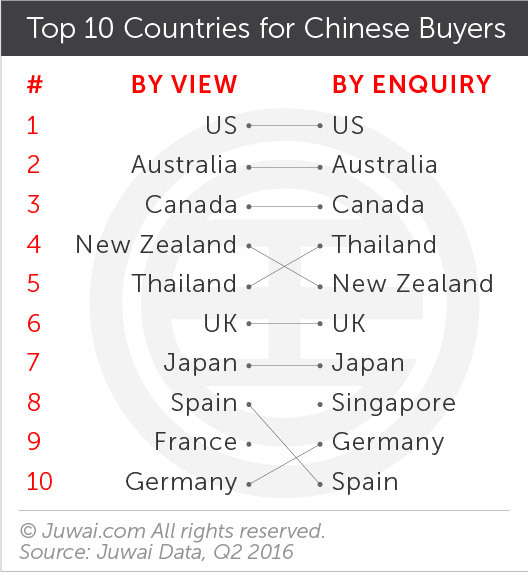 So, make sure that your listings feature these key elements to maximise your appeal to Chinese investors. Offer tailored tours with a personal touch: This not only helps your Chinese clients get the most out of their visit, but also offers the fullest picture of the local lifestyle. This could range from picking them up at the airport to bringing them on university tours, or even from taking them to sample the local fare to introducing them to the local Chinese community. If you don’t speak Mandarin, engaging a translator is also an excellent strategy to help deal with buyer’s questions and concerns. Walk them through the process: While Chinese buyers may be wowed by the prospect of an overseas property asset, some remain unaware of the processes required to make a purchase. To manage expectations of the sale process, consider listing the required steps to complete a deal. Connecting a potential buyer to a Chinese-speaking lawyer or immigration officer can also be a vital tactic that could just help you seal the deal. Now that we’ve shared some tips on getting China-ready this Golden Week, we wish you best of luck with grabbing a share of the October Golden Week sales bonanza. And if you can’t build your market plan in time, don’t worry – China’s next Golden Week opportunity is happening in January 2017, which is during Chinese New Year.